Does your small business require customers to meet a certain purchase minimum before they can pay with their credit cards? While this idea might seem like a practical way to offset the additional costs of credit card fees, it can actually have the opposite effect and cause you to lose a lot of business. In episode #143, Gene Marks and Elizabeth Larkin discuss the negative impact of setting a price minimum on credit card purchases as well as more effective payment policies. 2:26—Today’s Topic: Will My Small Business Be Impacted If I Set a Minimum for Credit Card Purchases? 2:54—When retail businesses impose specific payment restrictions on credit card purchases, they tend to lose a lot of business because their customers don’t want to be pressured into buying unnecessary items. 4:06—Instead of enforcing a strict payment minimum for credit card purchases, small business owners can impose an overcharge or surcharge to cover the additional fees associated with these types of transactions. 4:39—Providing multiple payment options increases your chances of a customer purchase. 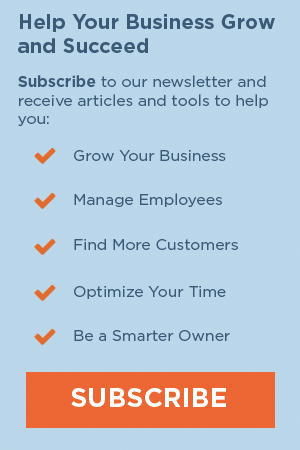 5:09—Small business owners need to keep up with the payment trends of their industry; otherwise, they will lose out on a substantial amount of business. 5:40—However, business owners also need to avoid the extremes of only accepting credit card or only accepting cash. 8:05—Gene encourages small business owners to invest in some type artificial intelligence software because these programs can help reduce the amount of time that they spend on customer requests and inquiries. 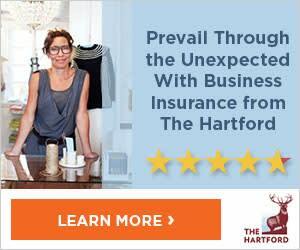 Elizabeth: Welcome back to the Small Biz Ahead podcast, I’m Elizabeth Larkin from The Hartford. I’m here with Gene Marks from the Marks Group. Gene: We’re live on video. Gene: This is our first video that we are doing together. Elizabeth: It’s a video camera. Gene: Video camera with audio. It’s got an app, it connects into our, you know, the phone and then you can go back and do different things. So that’s item number one, and item number two is this is The Hartford Stag everybody. The stag’s name is Larry. Correct? Gene: Larry, okay. That’s a little Hartford trivia. Elizabeth: I’m sure, people usually, when they think of The Hartford they think of those commercials with the stag going up the mountainside and I remember them back when I was little, like they would be on during the Olympics or something. It was very, like a big deal to see the stag. Gene: Well when I think of The Hartford, I think of you Elizabeth. Gene: That’s who I think of. Elizabeth: Also, on the video topic, you know how Gene in every episode, if you’re a new listener you’ll quickly find this out, Gene always thinks every small business owner should have a You Tube Channel. Elizabeth: If you’re thinking about doing that, the Meevo, which we’ll put it in the show notes, is probably a good purchase for you. Gene: I have a lot of clients that use it, it’s a good little tech. Elizabeth: So after we hear from our sponsor, we are going to answer a question about requiring minimum purchase prices for customers if they use their credit card. We’ll be right back after we hear from our sponsor. Question: Are You Losing Business By Requiring a Minimum Purchase for Credit Cards? Elizabeth: So we’re back, this week’s question was sent in anonymously, which is always a little disappointing because we do like to get a name and a location, but it’s totally fine. If I were asking this question I might try to be anonymous as well. The question is, “Am I losing business by requiring a minimum purchase for customers who want to use their credit cards?” So Gene, I’m going to let you tackle this one because I know you have very strong feelings about this topic. Gene: Okay. You’re losing my business if that is the case. I wrote about this recently, I talked about this elsewhere. I was coming home, it was on a Sunday, I wanted to just get a bag of chips from a convenience store. I was in Philly, and I went in there, and the bag of chips was like, I don’t know, two bucks or whatever it was. They had a minimum $10 purchase if you’re going to use a credit card. Gene: Now, number one, I don’t know who’s using cash anymore. Right? I mean like I don’t know, I use a credit card, I don’t even carry cash anymore with me. I walk in there to make the purchase, and it was not her fault, it was just the woman behind the counter. It’s like “Sorry I can’t do that, their rule is,” so I walked out. I didn’t buy anything at all. I certainly didn’t buy more to get to that $10 Elizabeth. I went back and I started doing the math for all of this. Elizabeth: You were desperate for the potato chips. Gene: You know, here listen, give me an option at least, right? Elizabeth: That’s a great point. Gene: So to answer the question that came in Elizabeth, yeah, I think you’re losing business if you have this minimum $10 purchase on credit cards. Plus I just think you’re, I don’t know, I just think you’re so old-school. Everybody’s using credit cars nowadays. It’s just it’s not thinking ahead. Elizabeth: They’re kind of expensive salads. Gene: Yeah, stuff that I don’t normally buy, but right. Elizabeth: Sprouts. Yeah. They don’t even accept cash, they only take credit cards now. Gene: That is correct. Then there’s the extreme, which we’ve talked about before, you go into like local mom-and-pop restaurants that only take cash. Then you got to go to their ATM in the back of the store, and pay a three dollar surcharge to use their stupid ATM machine. That drives me, you got to give options to your customers. Don’t let a customer willing to spend money, I don’t know if this grocery store, well these people are doing, but I don’t know, two bucks or two-fifty it’s still, how many of there people like me that are walking out the door. Elizabeth: Yeah. It seems like a convenience store as well, like you’re not typically going to make a purchase over $10 there. Elizabeth: Unless you’re buying gas. Gene: Yeah, I agree. Now this store in particular had like, I don’t know, they had a beer refrigerator, a specialty business, I guess people are going in and buying six packs or whatever, and that’s fine, but I don’t know, I just can’t imagine turning away a customer and saying “No, unless you spend $10 we’re not going to take any of your money at all,” in the convenience store business. Elizabeth: I’m sure that other business owners listening to this, or watching are going to have comments. Elizabeth: We definitely want to hear from you, you can leave a comment in the show notes. Leave a comment on the Facebook post. We’d love to hear your stories about why you either choose to have a minimum credit card payment option, or if you decided to get rid of that. Elizabeth: Like tell us what you decided to do, but in answer to the question, give your customers options. Gene: Yeah, and we can take this debate online, and if we want to go through the numbers together I’ll be happy to do that. There’s a great site called Nerd Wallet, which does a lot of credit card comparisons that are out there. Happy to take this debate with you online and go through the numbers, but I still say even if the transaction was an extra two dollars per transaction, I still say “Okay, then at least give that option to your customers.” I still believe that there is a percentage that will take that option and pay. You know, cash is green. Or plastic, or whatever it is. Elizabeth: Definitely. All right, we’ll be right back with Gene’s word of brilliance after we hear from our sponsor. We’re back with our word of brilliance. Gene: More than one word, but okay, so here’s my word today, it’s a company. The word is People.AI. You can Google this company. It is a small technology startup, and I became aware of them because they recently received a $30 million dollar round of financing. This is a pretty well-known venture capitalist. What I really like about this company is that they are working on artificially intelligence-driven software that helps make the sales process easier. To put this into plain English, say you have a system like a Salesforce.com or a Zoho or a Microsoft, whatever, a CRM system. Elizabeth: That could get scary. Gene: Or at least alert somebody else in the office that somebody has a question about this. So they can forward the email to the right person that might have a better response to it. Elizabeth: Okay, that sounds better. Gene: If a lot of the questions are, like in our business we get a lot of repetitive questions. It doesn’t take that many, it is what it is. Gene: Where myself and other people were spending time responding to these questions, I could be out and about doing other stuff while the software does that, and I get notified about it. When people talk about artificial intelligence, don’t worry if you’re a small business owner about investing in artificial intelligence Elizabeth. It’s happening. The big software makers that you’re using, again the Salesforce, the Microsoft, the QuickBooks, all those kinds of sages, they’re going to have artificial intelligence applications built into those softwares for you to use, and take advantage of them. Don’t shy away from them. Even your reaction of like “Oh that could get kind of hairy,” or whatever, I get that because that’s sort of the first reaction. Try and, I don’t know, take a step back and just make sure you’re comfortable with it, but don’t run away from it because this is the future and this is what’s going to happen. So People.AI, great example of a small technology company that’s developing great artificial intelligence software. Elizabeth: All right, great tip. Thanks for joining us this week everyone. We’ll be back in a couple days with our next episode. Gene: See you next time. One Response to "Will My Small Business Be Impacted If I Set a Minimum for Credit Card Purchases? (Podcast) | Episode #143"
on the credit card use question the idea of a surcharge sounds reasonable but it is illegal in at least 11 states. I am old school but the short answer here is keep a small amount of cash on hand, especially when you travel, the thought that you should be able to use a credit card everywhere is not realistic with the exorbitant fees CC companies charge. better to have no sale than lose money on every small transaction.